Lost wax casting is one of the oldest types of casting. It is a tradition that dates back over 4000 years and its current practitioners are found in many tribal cultures around the world. Before we explore some of those varied traditions, we need to define the process. In principle, "lost wax" casting means that first a wax model of the desired piece is made. This piece is then covered with slip, usually made from finely pulverized charcoal and clay which is then covered with a mud/dung mixture to form a mold. After drying, the mold is heated, causing the wax to melt and molten metal is poured into the mold replacing the wax. After cooling, the mud/dung mold is broken away to reveal the metal replica of the original wax model. As both wax model and clay mold are destroyed, each piece is unique. Solid casting and hollow casting can be done using this process. In addition, because the original is fashioned using wax, there is an extraordinary level of fine detail that can be achieved. Brass and bronze "lost wax" casting are part of a vibrant folk art tradition in West Africa, India, Thailand and the Philippines with ancient roots that continue in those communities up to the present day. In India, this type of metal casting is known as Dhokra and in West Africa--"cire perdue". Brass is an alloy formed from copper and zinc and bronze is an alloy formed from copper and bronze. In the past, the brass and bronze alloys were formed from smelting copper, zinc and tin. Today, the majority of "lost wax" brass and bronze castings are handcrafted using recycled metal, often old plumbing parts or other industrial pieces which lends an added 21st century "green" dimension to these unique pieces. 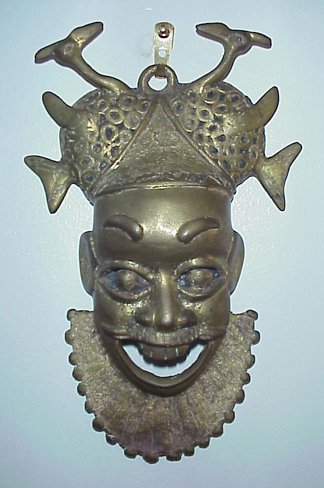 The Camerounian Face Mask pictured above was handcrafted in the Northwest Province of Cameroun, West Africa and is an example of a solid casting. Typical of the "lost wax" brass work in that region, the mask is highly polished in parts as well as blackened in other areas to add dimension to the overall design and effect of the piece. 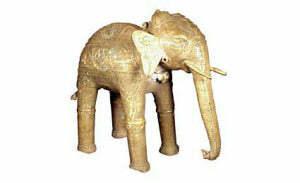 The highly detailed work on the Indian Dhokra Elephant pictured above was achieved using the technique of constructing the wax original from finely rolled wax threads. This dynamic piece, an example of hollow casting, was cast in two parts--the head and the body--which were then bolted together to form the elephant sculpture. T'boli craftsmen in the Philippines refer to "lost wax" casting as a process that unites earth, water and fire. To see and explore more examples of the varied "lost wax" casting traditions from the developing world, stop by our gallery, CADEAUX du MONDE, 26 Mary Street, Newport, RI or check us out on the web at www.cadeauxdumonde.com.